At a ceremony on June 26, Thrive Senior Living broke ground on The Tribute at Heritage Village, a 128-unit assisted living and memory-care community in Gainesville, Virginia. Located at the front entrance of Heritage Hunt, a 55+ active adult community, The Tribute at Heritage Village will feature two restaurant dining venues, a movie theater, spa, fitness center with state-of-the-art digital equipment specifically designed for seniors, and salon, as well as a doctor’s office and a telemedicine suite. A completely separate memory-care “neighborhood” will offer a secure environment for residents with Alzheimer’s and other forms of dementia; innovative programming will foster cognitive improvement and encourage connections between those residents and their friends and family. Technology will be at the forefront in the new community. The Tribute at Heritage Village residences will be entirely keyless, for example. Also, Thrive recently partnered with tech company LG to develop a Smart Senior Living platform that combines electronic health and medication records with an all-digital charting and record-keeping system and allows staff members to simply use a handheld device to access relevant information. The new system allows excellent transparency and accountability for care to both the resident and the physician—a true rarity in the assisted living industry, according to Thrive. “This community (and its sister communities underway nearby) will be a drastic departure from what most people think of when senior living comes to mind,” promises Jeramy Ragsdale, Founder and CEO. The Tribute at Heritage Village is the first of a portfolio of joint-venture projects that Thrive Senior Living will undertake in the metropolitan Washington, DC, market over the next 12 months with partners Harrison Street Real Estate Capital of Chicago and Palomino Capital of Dallas. Although development projects in the densely populated DC Metro area typically involve a lengthy, expensive, and sometimes difficult process, Thrive has targeted that market as part of its growth platform based on continued demographic demand and a lack of new and innovative competitors. “Overcoming obstacles in order to have the opportunity to change the landscape of senior living in such a dynamic market is an incredible opportunity,” according to John Toomay, President of Palomino Capital. Atlanta-based Thrive Senior Living is a privately held owner/operator and developer of assisted living and memory-care communities already established in Florida, Georgia, Louisiana, and Texas. The Tribute at Heritage Village, the company’s first Virginia project, is scheduled for completion in September 2015. Synovus Bank is providing the financing. An environment where residents don’t have to compromise their interests, hobbies, and beloved California lifestyle is the plan for a new assisted living project coming to San Jose, California. Plans for a “dynamic and relevant” assisted living facility in the heart of tech-savvy, innovation-loving Silicon Valley were created by BCA Architects, a design firm headquartered in San Jose, and recently received unanimous approval from the San Jose City Council and Planning Commission. Construction on the $25 million facility, as yet unnamed, will begin this fall with completion scheduled for fall 2015. So what does BCA have in mind for the new facility? “Baby boomers are, by nature, continual learners,” notes BCA’s president Paul Bunton, AIA, “and studies have shown that if seniors can continue to learn, they will live longer.” Hence, the location for the new facility is close to a community college that offers a continuing-education program. In addition, a “distance learning” classroom will be included within the assisted living space in order to help residents keep their minds active and thereby extend their quality of life. The property is also located directly across from the Santa Clara Valley Medical Center, which is convenient for medical appointments and emergencies. A shuttle service will provide transportation to a nearby shopping center. And since Californians of all ages traditionally incorporate outdoor activities into their everyday routine, the new San Jose facility will feature a resident-run garden. Ridgeline Management Company of Eugene, Oregon—one of three developer/operators being considered for the project—specializes in retirement, assisted living, and memory care and currently operates 17 communities in 10 states. Ridgeline owner Chuck McGlad, MD, looks to build environments that nurture individual expression and growth. “With baby boomers entering the assisted living market,” he explains, “we need to create spaces that allow both boomers and their families to continue the active lifestyles to which they are accustomed.” He further maintains that future designs will not reflect today’s typical assisted living home “with a bingo room and a library. Rather, the facility should create a culture in which residents can thrive and spaces where we envision our own families wanting to reside.” Dr. McGlad’s philosophy seems to fit neatly with BCA’s own vision. Residents have begun moving into Belmont Village West Lake Hills, a 141-unit assisted living and memory-care community on a 13-acre site in suburban Austin, Texas. The new community has 115 studio and one-bedroom apartments for individuals needing various levels of assisted care and a 26-unit memory-care neighborhood for those with significant cognitive decline. Rents start at $4,500 per month; amenities and services include chef-prepared meals with more than two dozen menu choices, a bistro for casual dining, housekeeping services, daily transportation, a fitness center with wellness programs and therapy services, a saltwater swimming pool, a full-service salon, a technology center, and Wi-Fi access. A licensed nurse, on duty around-the-clock, oversees care and acts as a liaison for health-care professionals and families. While other developers have senior communities underway in and around Austin, the capital region of the Lone Star State tends to be difficult for new developments due to its time-consuming review process. The entitlement process for Belmont Village West Lake Hills, for example, took three years to complete. In fact, Belmont Village Senior Living purchased the West Lake Hills property from a Houston investor whose own development plans failed to materialize. Designing the new community in West Lake Hills was fairly difficult, as well, due to the steep terrain of the land and the many trees on the property. The project took approximately 16 months to build and license. Morris Architects, based in Houston, designed the project; White Construction Co. of Austin was the contractor. Belmont Village Senior Living operates 22 other seniors housing communities in major metropolitan “high barrier-to-entry” markets that include Los Angeles, San Diego, Atlanta, Chicago, Dallas, and Phoenix. Belmont Village West Lake Hills is the company’s first community in the Austin market; however, additional development projects in the area are under consideration, according to Patricia Will, CEO. There’s no quicker way to get current on the home health and hospice M&A market or review historic M&A data. Learn all about today’s home health merger and acquisition market, not just what’s covered in major media.Take advantage of our limited time two-for-one offer: Order by July 31st and receive the 2013 Edition for FREE! 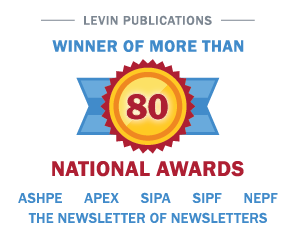 Go to http://www.levinassociates.com/home-health-description or call 800-248-1668 to order today.